14 years ago, the purpose of the Trail Stone map was recognized, and it indicated an exact spot on the ground, within 100 feet. 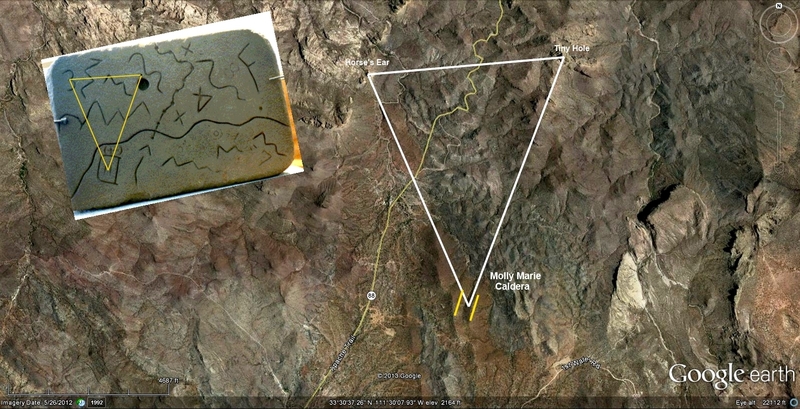 As mentioned on the Peralta Stone maps page, it was uncanny how accurate the triangle formed by the items on the Trail Stone map was in locating the position when it was used on the ground. Almost nothing about the geology was known then, but the map indicated a large area on a steep hillside that had been disturbed. That year the spring had been wet, and the disturbed area was covered by thick knee-deep grass like none found anywhere in the area. The same grass phenomena occurs at reclaimed coal mines when new dirt is deposited on the surface. After days of inspecting the area, it was certain the area had been massively disturbed, but the difficulty was proving it without digging dirt with machinery. After some research, it was found that seismic refraction was the best non-destructive method to use, and was good for surveys for less than 100 feet in depth. A 24 channel (24 geophones) all-in-one system with an on-boardcomputer was rented from Geometrics, and was used to perform 4 surveys of several disturbed areas. The surveys were performed with geophone lines 230 feet long. Good data was gained from the 4 surveys (100,200,300,400), and the data from 3 of them was analyzed by a geophysicist. The tomograms from all 3 areas indicated filled-in trenches. Unfortunately, the area at the tip of the triangle was not one of the areas surveyed. 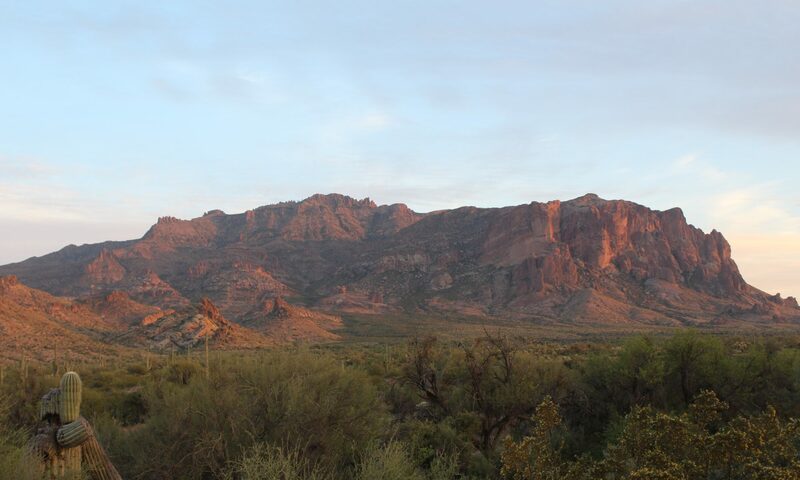 It was thought that if there was any prior surface mining done it was on veins like in much of Goldfield, and VMS deposits were not even contemplated. Today is has been discovered that the areas studied then are all surrounded by black Chlorite-altered rock. The data from the first survey was “sat-on” for about 9 years until more geology was learned. More gear was rented from Geometrics, and this time the new 24-channel “Geode” system was rented that uses a standard laptop for a computer. 8 areas were studied this time; VMS deposits were not recognized yet, but it was apparent that the disturbed areas studied this time were round or oval pits and not trenches from mining veins. This time though, the area indicated from the triangle WAS tested (5000). The data was screened by software rented from Geometrics, and 4 of the best data sets were transmitted to Zapata Geophysical in Golden, CO to create tomograms. All 4 data sets returned excellent results. Line 5000 returned the best results and below is a draft showing the refraction lines. A pit approximately 125 feet long and 40 feet deep is indicated. The tomogram is looking east into the hillside, and there is ridge of black chlorite altered rock that outcrops where the subterranean ridge is indicated on the left side. Another filled-in pit is indicated on the far left and it was not surveyed. It is at least as large as the one in the center and is centered on the bottom of the wash. Both pits are surrounded by intense black Chlorite-alteration. 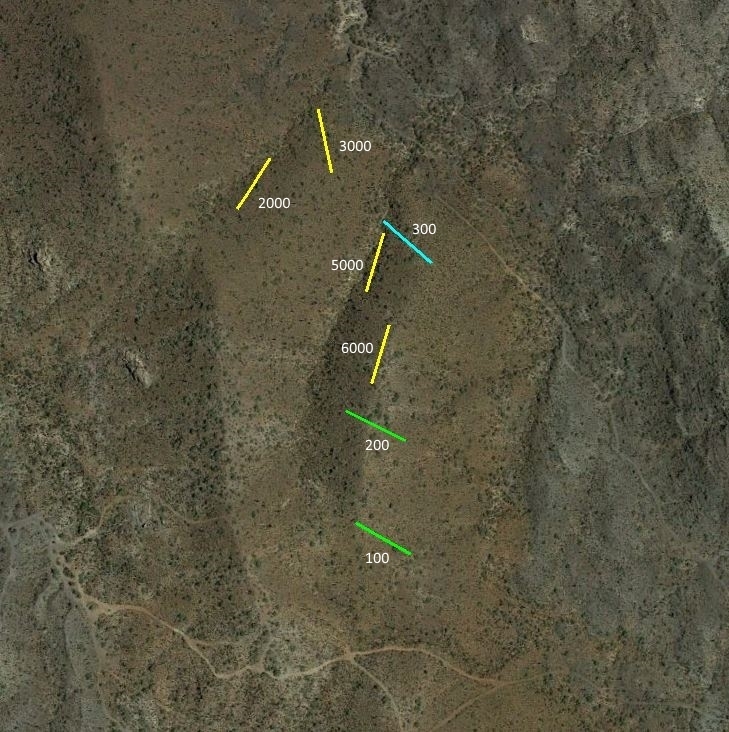 Below is a photo showing the position and locations of the seismic lines of surveys that were completed that were analyzed by geophysicists and returned results indicating filled-in pits. It is suspected that all of the pits were located on vents that extended from larger VMS deposits below. All of the pit locations seismically surveyed below are surrounded by Black Chlorite. 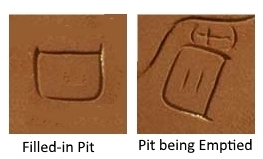 With the recent epiphany that the cup-shaped symbol indicates a filled-in pit being emptied (see below), the Trail Stone gives the exact location of the largest and most recent pit that was being mined before being back-filled in 1847-48. The Trail Stone map is really that accurate. It is extremely ironic that the Mexicans in 1848 accidentally left behind the directions to the exact location of the largest pit mine, and the Mexicans of 1853 also accidentally left behind the exact location of the the largest underground mine (the Salazar Survey).